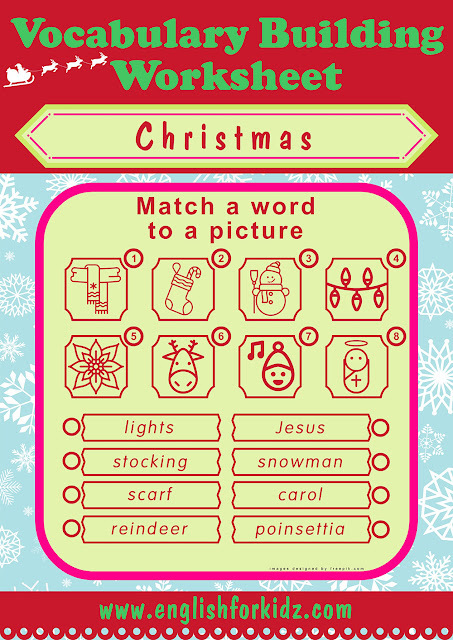 My ESL Christmas kit includes visuals (flashcards), games (Christmas dominoes and bingo) and worksheets (crossword puzzles, word search puzzles, word-to-picture matching and picture-to-word matching worksheets). 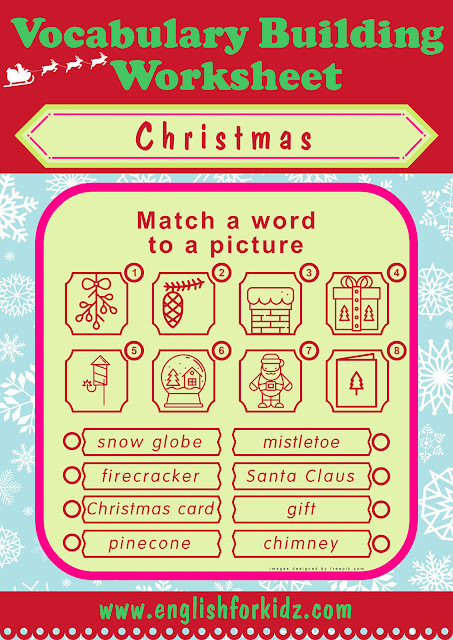 Flashcards help teachers introduce the Christmas vocabulary to kids. 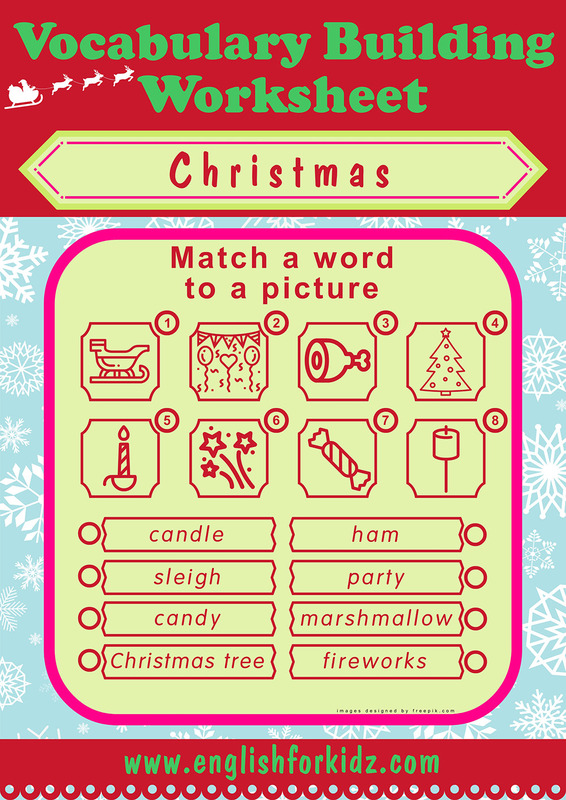 Games and worksheets are designed to make it easier for children to memorize the words. Such range of activities and exercises guarantees the long-term retention of the vocabulary. I use a similar set of printable visuals, games and worksheets for every topic I teach to my younger students. I especially like visuals as they are a universal teacher’s tool that helps both children and adults learn English. 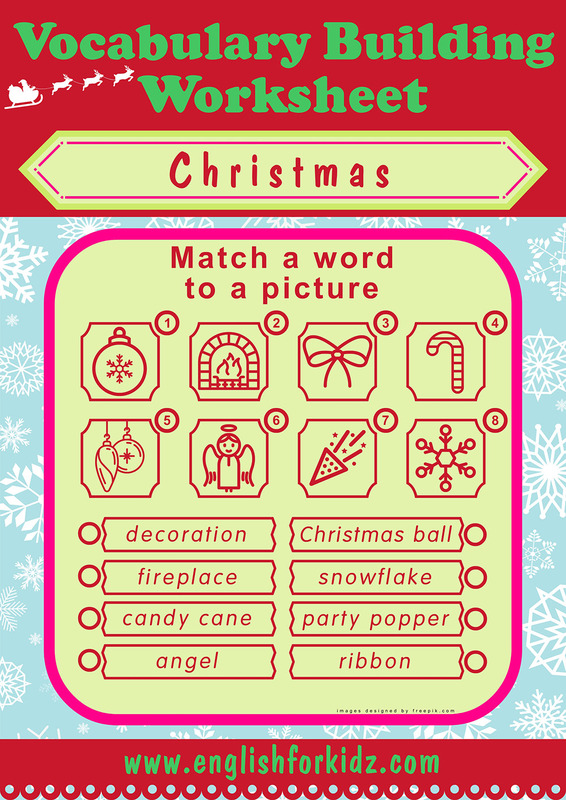 In this post I’d like to share my printable Christmas word-to-picture matching worksheets. 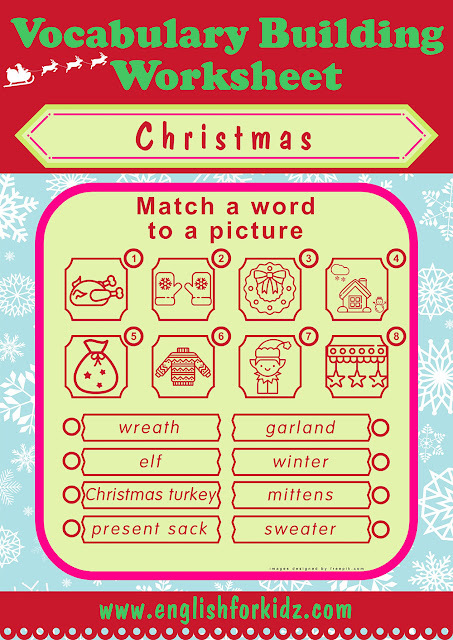 These worksheets offer a fun way to better memorize 48 nouns related to the holiday season such as Christmas food, decorations, characters, winter clothes etc. Christmas vocabulary worksheet featuring words sleigh, party, ham, Christmas tree, candle, fireworks, candy, marshmallow. 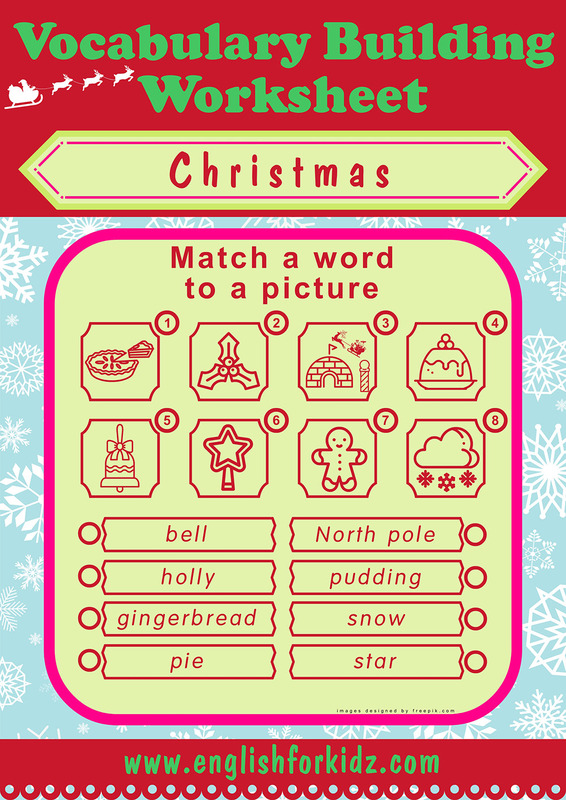 Christmas vocabulary worksheet featuring words pie, holly, North Pole, pudding, bell, star, gingerbread, snow. Christmas vocabulary worksheet featuring words mistletoe, pinecone, chimney, gift, firecracker, snow globe, Santa Claus, Christmas card. Christmas vocabulary worksheet featuring words scarf, stocking, snowman, lights, poinsettia, reindeer, carol, Jesus. 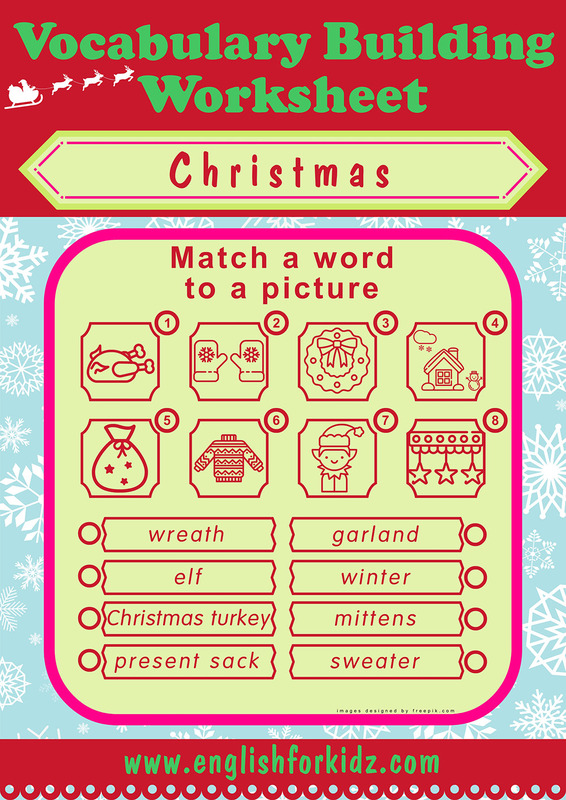 Christmas vocabulary worksheet featuring words turkey, mittens, wreath, winter, present sack, sweater, elf, garland. 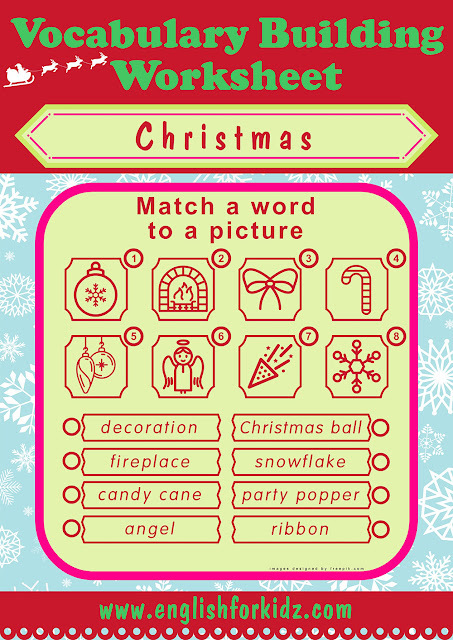 Christmas vocabulary worksheet featuring words ball, fireplace, ribbon, candy cane, decoration, angel, party popper, snowflake. Congratulations!!! It is very nice and interesting! I like your materials for Christmas.